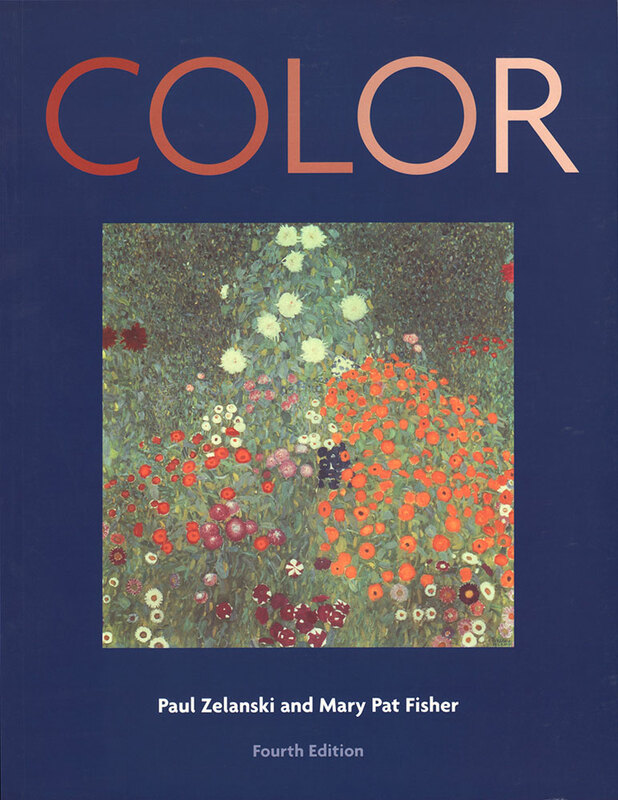 By Zelanski, Paul and Mary Pat Fisher. pp. 95 - 109, illus. because none of them could talk. Laser-cut prism installation in the cryptoporticus of the Domus Transitoria of Nero. The cryptoporticus was a cool underground walkway, lit by natural light through slots which Peter Erskine strategically appropriated for prismatic displays of spectral colors. We rarely pay attention to the primeval source of color on our planet: the light of our sun. 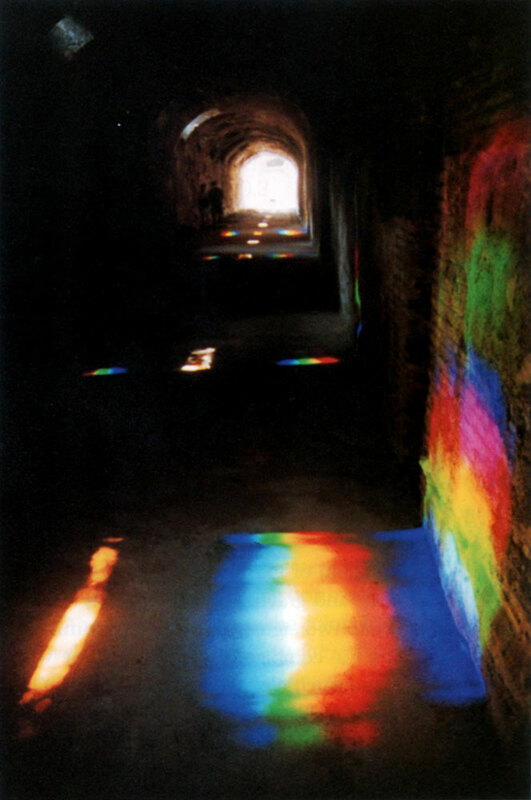 But to celebrate the millennium in Rome, Peter Erskine placed laser-cut, heliostat-oriented prisms among the ancient Roman ruins to follow the sun's beams as they played across the surfaces, refracting them into everchanging patterns of brilliant colors (8.1). Even artificially-created lights have in the past not been widely used as art media, though they have been extensively studied by scientists. Now, however, technology is turning the world of light into a luminous palette for artists. Potential areas in which light can be manipulated include video, computer graphics, lasers, and holograms. The term video is used both for electronic light signals broadcast to television sets and for images displayed on television monitors directly from videotapes. These dynamic visual images are usually recorded electronically by video cameras, which scan a scene to analyze and communicate its light patterns. The light received in the camera is divided by a system of mirrors into the three light primaries — red, blue, and green. For transmission, these are then converted into two signals indicating chrominance or chromaticity (a combination of dominant wavelength. or hue, and purity, or saturation) and luminance (the light-mixture equivalent of value in pigments). This information is broadcast through the air or fed electronically to a receiving monitor, which decodes the video signals corresponding to the light primaries. These are sent through electron guns, usually one for each primary. Each sends beams to the screen of the picture tube, the inside of which is coated with hundreds of thousands of tiny dots of red, green, and blue fluorescing powders, called phosphors. When hit by electron beams, they give off a certain amount of light, depending on the luminance signal. In many television sets, a shadow mask — a metal plate with thousands of small holes — is used to keep the electron beams focused only on one triad of phosphors at a time, preventing them from spilling over into other areas (8.2). The electron guns rapidly scan all the phosphors, traveling along horizontal lines, and thus rebuild the image on the entire screen just as it was when originally scanned by the video camera. This process occurs 30 times a second in a standard screen in the United States, which is composed of 525 scanning lines. The European system uses 625 lines, scanned 25 times a second. The persistence of our vision keeps the image from appearing to flicker. The upper picture is a considerably enlarged diagram of the mosaic of red, green, and blue phosphors on the screen of a television set built on the shadow-mask system. 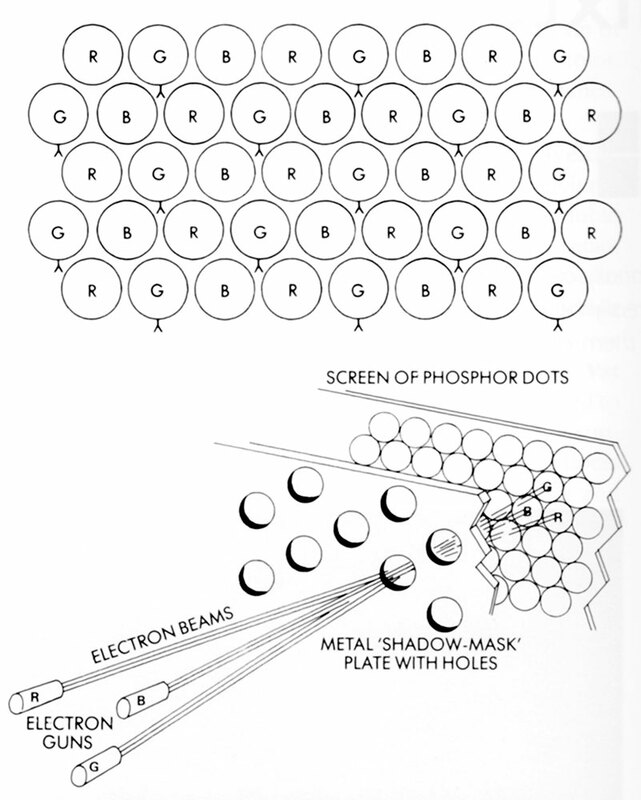 Below is an enlarged diagram of the shadow mask, showing its use to focus the electron beams on one triad of phosphors at a time during the scanning process. Red, blue, and green are used as primaries in video transmission because they can produce the widest range of mixtures. It comes as a great surprise to many people that there is no yellow in a television tube. The yellow' that we "see" on a television screen is actually an optical mixture of tiny dots of green and red. Green and blue juxtaposed in space or flashed quickly one after the other will produce a cyan sensation; red and blue juxtaposed in time or space will appear magenta. Black areas have no light coming through; white areas are a mixture of all three primaries. Luminance (value) differences are controlled by the amount of light released. The saturation and balance of colors between the three primaries can be controlled to the viewer's taste by adjusting controls on the monitor. In early television transmission, colors were exaggerated to demonstrate the flashiness of the medium, but nowadays somewhat more subdued, natural colors are preferred. Computer graphics use monitors that are essentially the same as television screens. They use the same red, blue, green primary system of phosphor activation, though they are capable of slightly higher saturation. Video and computer graphics have w ithin their range a greater degree of saturation in colors than is possible with any subtractive medium, for they are based on the purity of colored lights. However, phosphors are not as pure as they theoretically might be, and the trichromatic mixing system means certain mixtures are not possible. Figure 8.3 uses the C.I.E. chromaticity chart (see p. 73 and 7.7) to illustrate the parameters of modern computer graphics color capabilities. 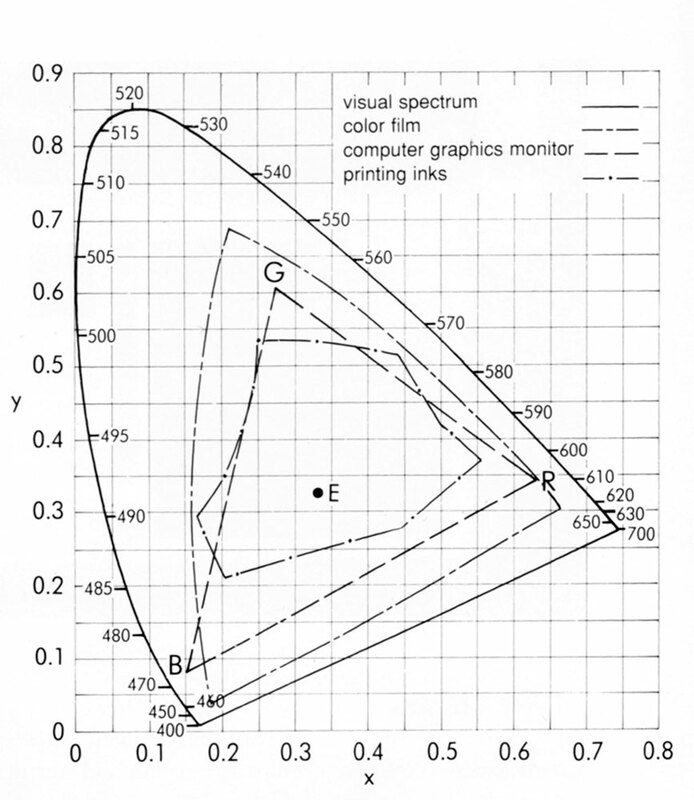 Chromaticity coordinates for the red, blue, and green primaries in a standard computer monitor form a triangle that is much smaller than the flatiron shape formed by the whole range of spectral colors. The purest spectral colors fall along the outer edge of this shape, with saturation decreasing gradually into the central point of equal energy (E), where x and y = 0.333. This point represents neutral colors, from black to white, with their value depending upon the degree of luminance, which is not shown in this two-dimensional diagram. The primaries do not reach the corners of the flat iron because the phosphors are not as pure as spectral hues. Moreover, nothing outside the triangle can be mixed using the three primaries. Along each edge, hues are pure mixtures of the two connected primaries; within the triangle, all three primaries are involved to some extent in the mixture, until finally they all mix to a neutral in the center. The only way to mix a color outside the triangle is to have negative hues available as mixers — such as a minus blue which would subtract enough blue from the green and red to produce a pure yellow. Mixing a high yellow is the biggest problem with the RGB monitor; highly saturated cyan and magenta are also impossible. These limitations are actually not apparent to the average eye, which finds the outer limits of computer graphics colors brighter and more saturated than any pigment colors, as indeed they are. Furthermore, computer graphics programs for color mixing are becoming increasingly sophisticated and are now able to create very fine gradations of hue, value, and saturation. There are a number of ways of setting these up. Printing inks can reproduce only a comparatively small portion of the visual spectrum. Color film can reproduce a larger range than a television or computer monitor. Popular desktop graphics systems offer two simple ways of creating over 16 million colors, far more than the eye can actually distinguish. Firstly, the user can hold a "dialogue" with a color map, such as a wheel divided into hues with concentric circles showing gradations in saturation. 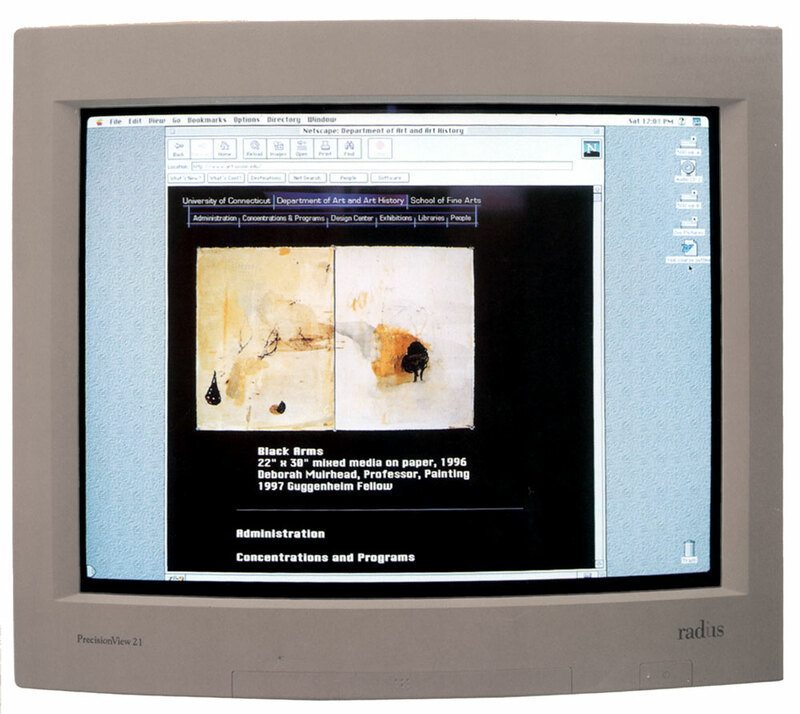 Using a "mouse" to position a pointer on the screen, the computer artist can point to a place on the wheel and it will be displayed in a box. Placing the pointer close to yellow in the red area, for example, will bring up an orange. Slight movement of the pointer will make the color chosen more red or more yellow. The brightness (value) of the whole wheel can lie changed by another maneuver. The second way of choosing a color Is numerical, by specifying saturation and brightness on a scale of 0 to 65,535 for each of the primary hues. The box showing the first color chosen may have a split screen; to change it slightly, one could choose a slightly different number to see the result, whose color is displayed next to the first color on the split screen. The ease of color mixing with such a system makes color relationships fascinating and fun to manipulate. Adobe Photoshop, a popular graphics program, presents a display on the monitor with a variety of ways of selecting a specific color. As shown in Figure 8.4 [not shown, ed. ], the computer artist can move a small circle through a field of variations on a hue to select the one desired, or move arrows along a linear display, or type in the subtractive CMYK or additive RGB or HSB (hue, saturation, brightness) numeric values of the color. Once the hue is chosen, the numeric CMYK notation calculated by the computer can be used in specifying printing inks. In addition to using on-screen color-choosing devices, those with engineering training can program color mixtures numerically. 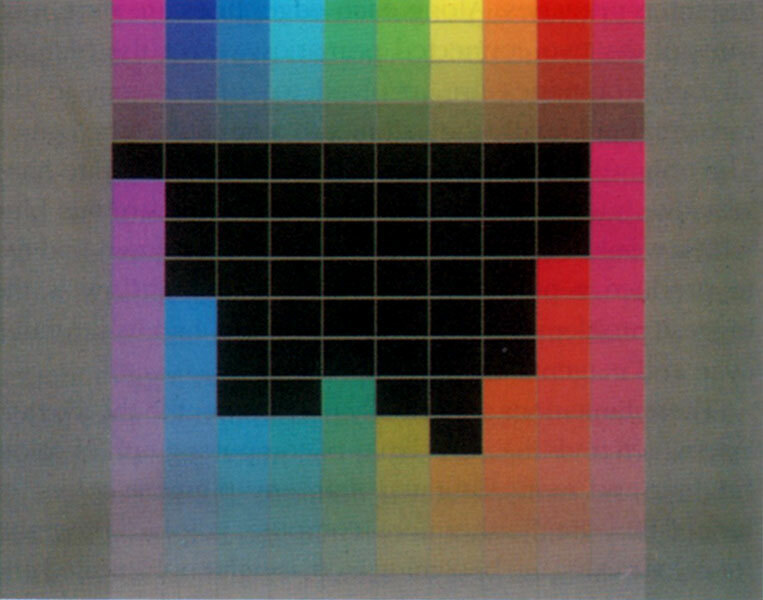 Colorist Nathaniel Jacobson and computer specialist Walter Bender of the MIT Media Lab have collaborated to try to create computer color maps based on the Munsell system of color classification. The colors shown in this custom computer palette (8.5) are deliberately muted to approximate the softness of pigments rather than the glare of phosphors; none are shown at the maximum saturation possible for the monitor. In addition, they are programmed to vary in visually equal steps, as in the Munsell system. One might think this would be easy on the computer, but it is, in fact, quite difficult, for mathematically equal amounts of light energy do not create visually equal steps in value. They must be measured by the most sophisticated of visual instruments: the human eye. 8.6 Ed Manning, Watson and Manning, Inc., The Mona Lisa Blocpix Image. The last frame is the painting itself—not a computer image. Colors can he added to computer drawings by using an electronic drawing pad, a light pen to touch areas on the screen, or a pointing device such as a mouse to "click" the colors into place. They can also be programmed to develop along with computer-generated imagery such as the fractal image displayed in Figure 2.8. Another approach to color in computer graphics is to digitize or quantize an existing image. This basically means electronically scanning and converting it into numbers that correspond to points on the x and y axes of the monitor screen as graphed in Figure 8.3. Computers with graphic capabilities have screens divided into pixels, which are individual picture elements, like mosaic tiles. The more pixels, the finer is the possible resolution in the image. 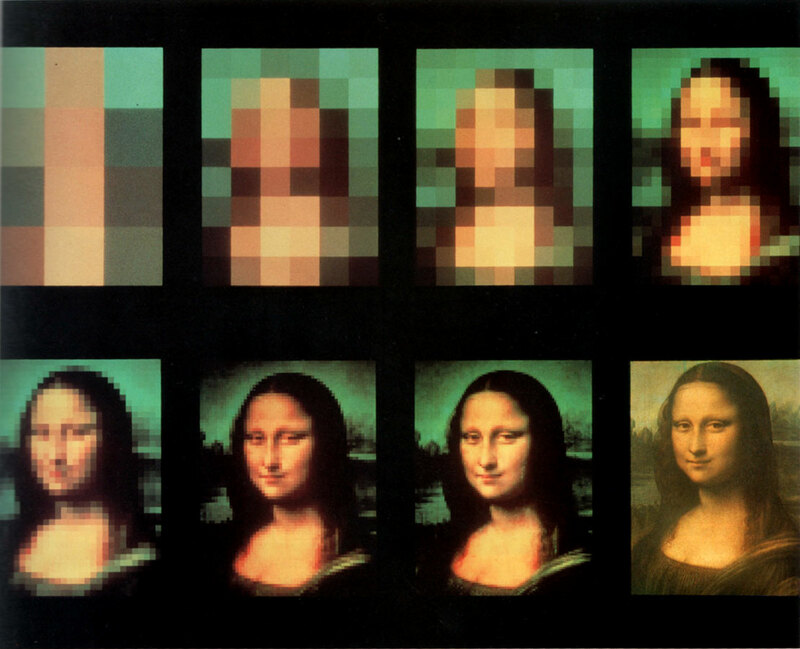 Figure 8.6 demonstrates the visual results of digitizing the Mona Lisa with increasing numbers of pixels. The color variations — averaged for each pixel — become finer and finer mosaics of colored blocks. It is possible to render an image with what appear to be continuous gradations in tone if the computer has a substantial memory. The larger the computer's memory, the more pixels it can support. You have to know when to blow the whistle on yourself. We have this incredible wide-open possibility, but we have to learn when to say no and when to say yes. It's like having a wonderful musical instrument that can make any sound in the world — but you have to put those sounds together to make a beautiful song. 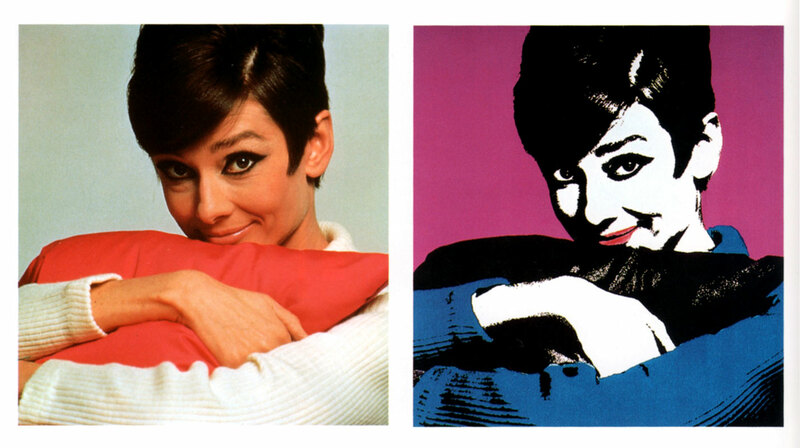 8.7A (left) Douglas Kirkland's original photograph of Audrey Hepburn. 8.7B (right) A version of the same photograph, digitally manipulated to appear as a high-contrast image of bright, flat colors. In Adobe Photoshop, a user-selected range of color choices in the image are displayed side by side to help in making aesthetic choices. The "current pick" is juxtaposed with other possible choices as one works with alterations in hue, value, or brightness in the shadows, midtones, or highlights. The entire original may be shown in reduced size in many variations side by side on the monitor, or the image may be "cut" into "test strips," as in Figure 8.8. This allows the computer artist to apply separate color treatments to each section and view the result before printing, like a traditional photographer making test strips with different color filters. To avoid obvious jumps between different hues and values used in representing gradations across a three- dimensional form, the PostScript program offers up to 256 gradations between two colors, for the equivalent of an air-brushed effect. This number of choices is not necessary in a small area, but if a program had only 50 choices and if they were stretched across ten inches, there would Ire only five bands of color per inch. In such a case, the bands themselves would be noticeable as hard-edged shapes, an effect that an artist might not desire. A person with normal color vision can distinguish approximately 150 different hues in the visible spectrum. Scientists calculate that when differences in value and saturation are factored in, our eyes can probably distinguish about seven million different colors. But high-end computer workstations can generate a palette of 16.7 million colors on the screen — almost ten million more than we can actually see. Is this pointless extravagance? Perhaps not, for this tremendous ability allows for very gradual gradations lietween colors. We can visually detect very small differences between certain hues, but not between others, so such abundance of differences is necessary to ensure that nowhere in the even subdivisions of color choices can we detect unwanted jumps. "Hard copy" output from what is created on the computer screen may take the form of high-resolution film negatives, slides, or paper prints. Usually some kind of color printer is used initially by computer artists to check the results before the disk is sent to more expensive output devices. As prices of computer-driven printers fall and their quality improves, many graphic artists are also producing usable final results with their own desktop computer systems, for short-run applications such as signs and displays. Both the cheapest and the most expensive of color printers are based on inkjet technology. In these, colored ink is sent through nozzles onto the paper by heat or hydraulic pressure. Low-end color inkjet printers are quite inexpensive, but they cannot provide brilliant, accurate color, as can be seen in comparing Figure 8.9A with other options. Most graphic artists thus use desktop inkjet printers only for rough comps or simple transparencies and presentations. At the other end, very expensive gidee printers are also based on inkjet technology. Here, tiny dots of varied sizes are squirted from CMYK nozzles onto paper or other material. on a drum rotating 100 to 150 inches per second in the case of the Iris 3047 printer. It may take up to an hour-and- a-half to fully build up the image, which nearly approximates continuous tone. The more expensive inkjet printers use six or eight colors of ink. rather than four. Figures 8.9A. B and C show the different results obtained from three types of printer. 8.9A (left) An inkjet reproduction of an image, with 500 percent enlargement to show how the color is laid down in dot patterns. 8.9B (center) Laser reproduction of the same image, with 500 percent enlargement showing dithering of the dot patterns. 8.9C (right) Iris (giclee) reproduction of the same image (with 500 percent enlargement), approaching continuous tone printing. Another technology supports color laser printers. A laser beam is used to charge the dnim in an area to lx* printed. This charge attracts toner particles, which are thus drawn to the page and thence fused to the paper by heat. Figure 8.10 illustrates the basic mechanism used. There are four separate toners and developers for the CMYK colors. These toners are not so bright as thermal wax, but the images are clearer than those from low-end inkjet printers. 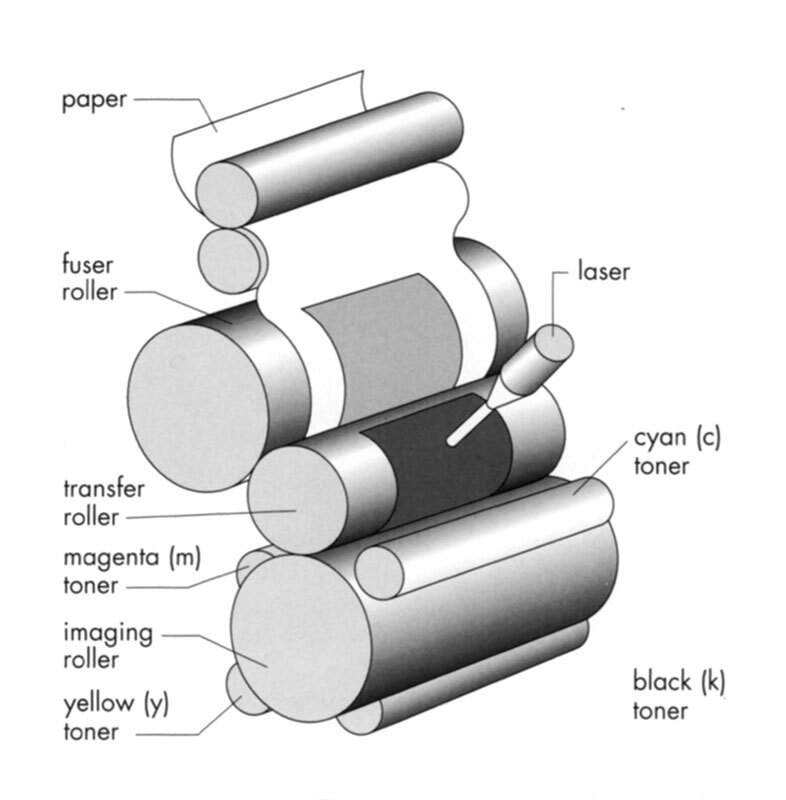 8.10 In color laser printers, the laser beam charges a drum, attracting toner particles.They are then fused to the paper by heat. Although the sophistication of the printer will influence the quality of the reproduction, no process using printing inks can equal the brilliance of the hues created on the screen with pure lights. Better reproductions are possible with special cameras that photograph the screen, or even better, make a slide from the electronics. 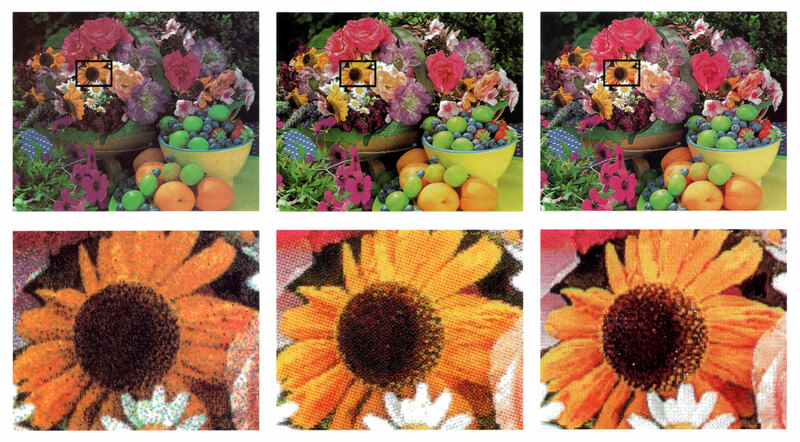 Some of these can create a very dense image by averaging the color between the pixels. Such equipment, however, is still very expensive. Graphic designers are now frequently called on to provide precise color-matching with computer technology. Color management in computer graphics means the use of computer software to consistently produce the very same colors from one device to another, such as from computer screen to print, or original to print, or one screen to another, or print proof to final proof. This is not an easy matter. The additive colors seen on the screen in phosphors of red, blue, and green are quite different from subtractive prints created from cyan, magenta, yellow, and black (8.11). 8.11 Website of University of Connecticut, Department of Art and Art History. To reproduce the same color precisely in substractive and additive technologies — such as this computer rendering of substractive art — requires complex color management. Whereas the computer monitor can display over 16 million colors, no printing system can reproduce them all. There are only one thousand Pantone spot colors; the best CMYK printers can only reproduce about 5,000 colors. Even a color transparency can reproduce "only" 15.000 colors. 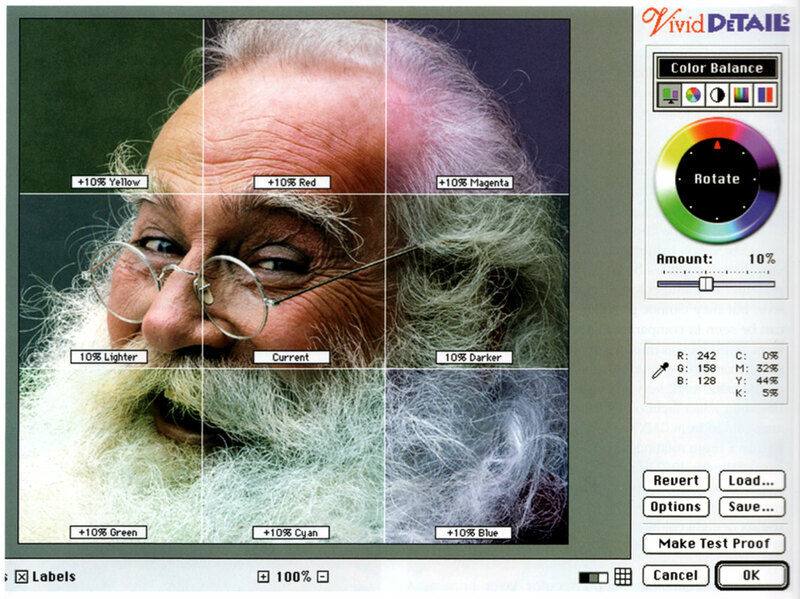 Color management thus inevitably involves limiting the computer's output, as well as attempts to ensure that the color seen on the monitor or in chosen color swatches matches what is printed. Precise calibration of all devices — scanner, monitor, proof printer, and final printer — also becomes necessary. Computer software providers have adopted a uniform C.l.E. method of calibrating scanners by using them to read a standard "scanner target" of color patches. However, there is no uniform way of calibrating color printers, and the colors seen on different computer monitors may differ considerably in contrast, color balance, hue, and saturation. As the potential for accurate color reproduction has developed in computer graphics, graphic artists' work has become more complicated as they strive to coordinate all systems for precise color matching. It is likely that these complications will be considerably ironed out in the future by new software, but the basic gap between additive colors and subtractive colors will nonetheless remain. An experience made at the beginning of the photographic work repeated itself at this point: we thought at first that it would be painters who made use of the new medium, leading it into branches of art; in reality, such people showed a lack of interest and a new branch of the arts came into existence. 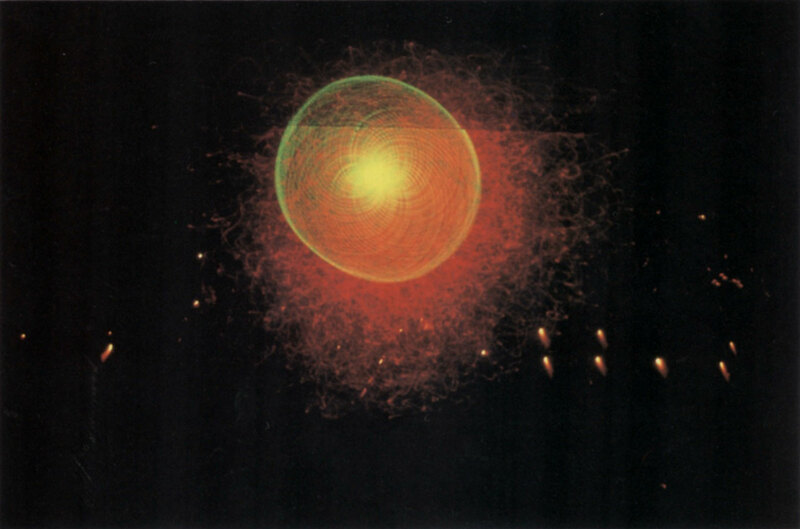 Computer graphics have also been largely ignored by exponents of the visual arts. The people who are today concerned with computer animation come only to a small extent from the ranks of the visual arts. A much larger proportion of them rely on training as photographer or cameraman, mathematician or programmer. It is obvious that artistic possibilities opened up by computer graphic systems are leading to the formation of a new profession, standing somewhere between art and technology. DIBIAS picture processing system. Computer graphics can be used to develop color stories varying through time. worked with transparency and textured shadow-casting to create spatial ambiguity, merging objects and space, figure and ground. ... Just as the invention of film — through the technology and craft of photography — extended the stillness of painting into the flow of time, the technology associated with immersive virtual reality extends beyond the two-dimensionality of painting and film, into enveloping "circumferal' space. ... In works such as these, perceptual boundaries between inside and out may be experienced as permeable as the virtual and immaterial are confused with the bodily-felt, experienced as strangely real. Tlte visuals in these works are soft, luminous, and translucent. consisting of semi-transparent textured three-dimensional forms and flowing particles: the three-dimensional forms have been designed to be neither wholly representational (i.e. recognizable) nor wholly abstract, but to hover in between, creating perceptual ambiguity. By animating these forms, and by enabling the participant not only to see them but to float through them as well, it is possible — because of their varying degrees of transparency — to create spatially ambiguous figure/ground relationships. ... In my work, ambiguity is the key to softening, lessening the distinctions between things. 8.13 Char Davies, still from Ephémère (1998). Virtual reality installation. The merger of art and technology has also carried light mixtures into brilliances equal to that of the sun, in the form of lasers. Originally developed for scientific purposes, laser lights are also used to create kinetic art shows. Prior to the invention of lasers in the 1960s and 1970s, it was impossible to work with coherent light — light in which waves are all of the same length, in unchanging relationship. Laser light approaches this ideal. It is generated by an oscillator, which creates pulses in a thin tube filled with some electrically excitable medium, such as helium and neon. Light projected into this cavity is reflected many times from one end of the tube to the other by a system of mirrors, creating standing waves of energy. The medium used determines the spectrally pure color that results from this process. A helium and neon mixture gives a coherent red light of 633 nanometers. Laser sculptures can be created by setting up reflecting materials in the path of the thin laser beams or by projecting the beams through a smoky atmosphere so that they can be seen. For laser light shows, the beams may be moved so quickly that persistence of vision causes viewers to perceive lines of colored lights on a screen rather than moving dots of light. Their movements may be coordinated with music, either manually or electronically. Video/Laser III, constructed by music professor Lowell Cross and physics professor Carson Jeffries, has been used to create the symphony of light envisioned by Scriabin for performances of his Prometheus (8.14). Advances in laser technology have also made holograms possible. These are two-dimensional images formed by wave fronts of light (or sounds or electrons) that reconstruct the visual impression of a three-dimensional object. To create this effect, a laser beam is split. Part of it — the object beam — is reflected onto an object from an angle; the other part — the reference beam — is projected onto photographic film. The light waves bouncing off the object from the object beam intersect this non-reflected light on the film, creating an optically three-dimensional interference pattern. When the resulting hologram is viewed from different directions, the part of the image seen changes, just as it would if one were moving around a three-dimensional object. Although this technology is being employed in many nonaesthetic ways — such as difficult-to-forge images on credit cards — some artists have adopted the hologram as a means of creating imagery with the glowing purity of pure spectral lights. Some would maintain that lasers and holo­grams reveal the essence of color: having no substance, they are an optical phenomenon resulting from the eye's response to the reflection and refraction of clear light. Contemporary electronic possibilities have led to entirely new kinds of aesthetic experiences — multimedia installa­tions in which computer-controlled sounds, laser light dis­plays, holograms, video art, and virtual reality setups surround and perhaps interact with the viewer. These pos­sibilities are requiring revamping of museum and gallery' spaces so that participants can explore ephemeral worlds of pure light. The excess Paik produces in his art, both its carnivalesque euphoria and its melancholic distraction, engages a bigger problem than does much recent media art: the problem of tele­vision and its role in our world. Paik pummels the television set, extracts its guts and spills them on the floor. But at the same time, he teases out of the monitor a hybrid video stream composed of diverse elements, synthesized and reordered. In other words, Paik sees television as both a set of institutions and a language that is probably the most widely "spoken" in the world. Laser light, waterfall, mirrors, steel armature. Bohen Foundation Collection, promised gift to the Solomon R, Guggenheim Museum, New York. 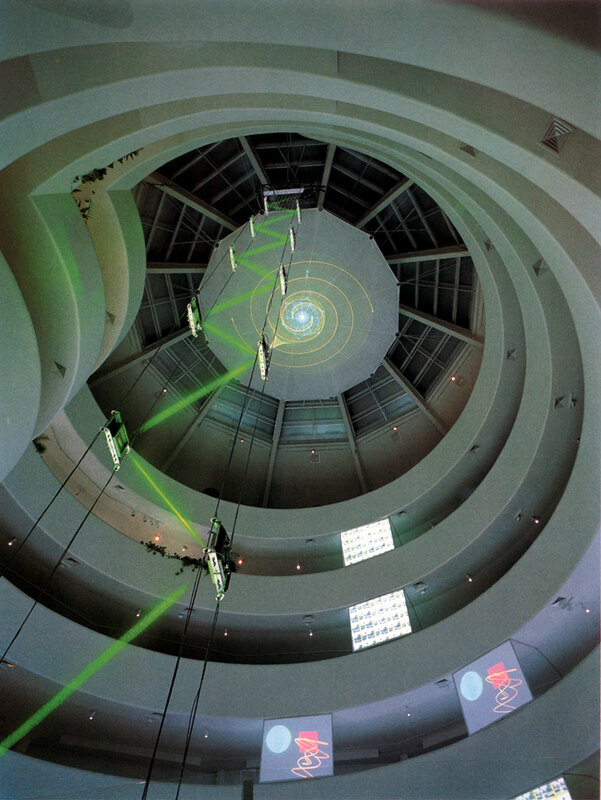 Nam June Paik employed an array of light technologies to create this installation as part of a retrospective of his work that occupied the entire Guggenheim Museum.